This year’s San Diego Comic-Con was like the movie equivalent of a nuclear arms race; each studio trying to outdo the others with the biggest and most intricate comic-book movies conceivable. Warner Bros. announced Batman and Superman together in a single film. Marvel hyped Guardians Of The Galaxy and The Avengers: Age Of Ultron. Fox, using characters licensed from Marvel, pimped X-Men: Days Of Future Past, with a cast that includes almost every single mutant that’s appeared in the series’ first six films. Fox is also working on a reboot of Fantastic Four, the Stan Lee/Jack Kirby superhero team that first turned Marvel Comics into the industry powerhouse it is today. Fox’s first two FF films were financial successes and creative misfires; now they’re starting from scratch with director Josh Trank (Chronicle) at the helm. Meanwhile both franchises, X-Men and Fantastic Four, are receiving guidance from “creative consultant” and comic-book writer Mark Millar. 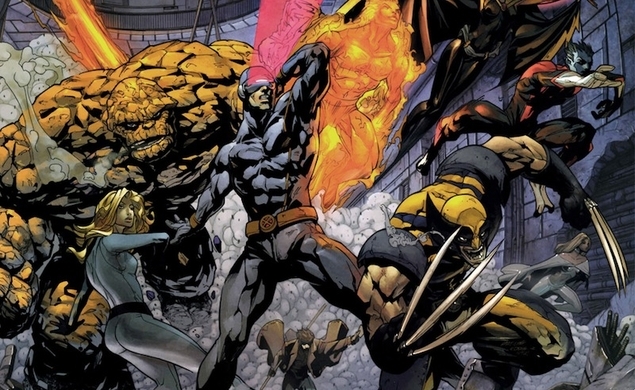 Basically, we need to start mentally and emotionally preparing ourselves for the inevitability of a Fantastic Four Vs. The X-Men movie. And then a Fantastic Four Vs. The X-Men Vs. The Avengers Vs. Spider-Man Vs. Batman Vs. Superman movie, followed by Every Comic Book Character Ever Made Vs. Every Other Comic Book Character Ever Made, followed by a total and complete cinematic singularity that will swallow us all and doom our world to eternal darkness (in 3-D).